A new study says the change could save lives and improve health statewide—good news for the 40 percent of poor households led by single women. Significantly raising California’s minimum wage could save lives and and improve the health of poor women and the children they raise on their own. That’s according to a new report that examines how a proposal to lift the state’s minimum wage from its current $8 to $13 by 2017 would affect indicators such as hunger, obesity and psychological well-being among the state’s impoverished families. California is one of twenty-seven states that already have a minimum wage higher than the federal minimum, which is currently stuck at $7.25 despite congressional Democrats’ and Obama’s efforts to raise it to $10.10 per hour. In July, the state minimum will rise to $9 and to $10 by 2016, but that’s too slow and too small a hike to have any real impact on the estimated 8 million Californians living in poverty, says state Senator Mark Leno, the bill’s author. And refusing to boost the minimum and then peg it to inflation, as Leno’s bill would do after 2017, is especially an affront to households headed by unmarried women, which make up just 13 percent of the state’s families but 39 percent of those living below the poverty line. It’s well documented that a minimum wage that hasn’t kept pace with inflation is particularly bad for women. 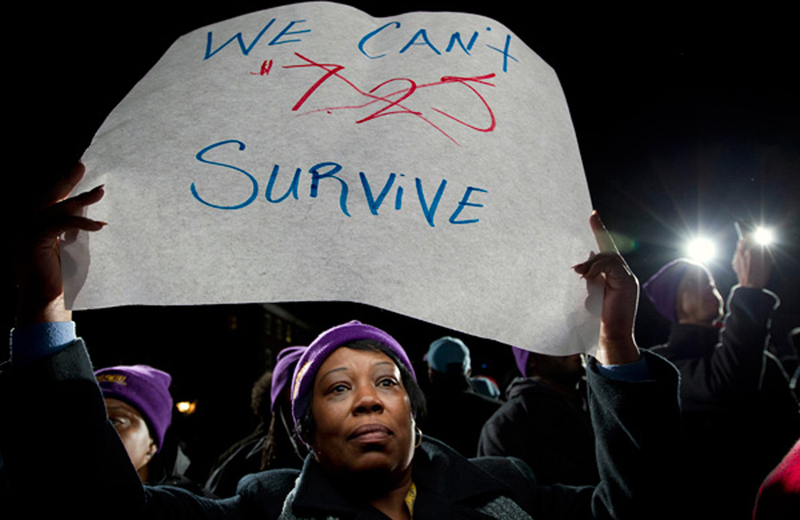 Nationally, women make up two-thirds of minimum-wage workers and are disproportionately women of color. What this latest report offers is insight into what poverty wages mean for Californians beyond their ability to keep food on the table and a roof over their heads. It points out that the infants of low-income women are more likely to be born prematurely and have low birth weight. Eventually these children are more likely to be diagnosed with developmental delay or chronic health problems such as asthma. Being poor as a child can lead to a shortened life span, even if socioeconomic status improves in adulthood. By raising the minimum wage to $13, an estimated 390 premature deaths could be avoided in the state per year, data analyzed in the report suggests. A low minimum wage forces many of these families to rely on Medi-Cal, the state’s Medicaid program, which expanded to include children as part of the Affordable Care Act. According to one study, around 2 million working families in California are enrolled in at least one public assistance program. That accounts for nearly half the state’s public benefits spending. It’s further proof that keeping the minimum wage low means not only hurting the health of the state’s families, but also shifting the high cost of care away from employers to the public. Leno’s proposal to raise the wage is in the state Senate’s appropriations committee. A hearing is scheduled for today.